Karina Drees, who will assume duties as CEO and General Manager of Mojave Air & Space Port in January, will be among regional business and industry leaders to speak at the Antelope Valley Business Outlook Conference Feb. 26, 2016. Drees, deputy general manager of MASP, has been named to succeed CEO Stu Witt upon his retirement at year end. Drees, 39, joined the Mojave Air & Spaceport management in July 2012 as director of business development, and was advanced to the post of deputy general manager a year later. She worked with the Mojave Air and Spaceport in 2007 in developing an access-to-space plan for commercial operations of the new space transportation vehicles under development in Mojave. 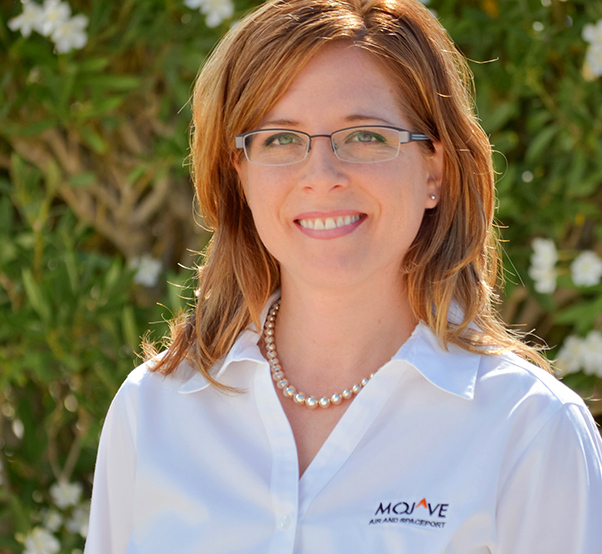 Prior to joining the Mojave Air and Space Port, Drees had more than 12 years’ experience in strategy and business development, occupying management positions for growing technology companies. As CEO, Drees is responsible for maintaining more than 3,000 acres of property and managing 150 tenant contracts. She oversees all air and space operations at the airport and manages procedures, business operations and regional partnership development. Drees leads the implantation of strategic initiatives for the benefit of the companies operating in Mojave as well as the region. Prior to MASP, Drees held senior positions in strategy, business development and operations for growing technology companies. She was most recently a member of the strategy and positioning team at SRA International where she identified opportunities for multiple divisions within the company. Before joining SRA, Drees held leadership positions at two investor-backed high tech startup companies in the Washington DC area. Drees has a BS degree from Arizona State University and an MBA from the Massachusetts Institute of Technology Sloan School of Management where she ran the MIT $100K Entrepreneurship Competition and was a board member for that competition. She also completed International Space University’s Summer Session Program in Beijing, China. Drees becomes the third general manager in the history of the former World War II-era Marine Corps air base, which became a general aviation airport and home to innovative civilian flight test in the early 1970s. Her selection was announced by Mojave Airport District Board President Allen Peterson, who declared her to be the best qualified candidate in the search for Witt’s successor. Karina lives in Mojave with her husband Todd Quelet and their son. Sponsorships and tickets are available for the 44th Annual Business Outlook Conference. Go to www.avbot.org or call 661-947-9033 for more information. The event will be at the Antelope Valley Fairgrounds and includes a buffet breakfast and lunch, exhibit booths, swag bags, speakers, and networking for 800 plus attendees.